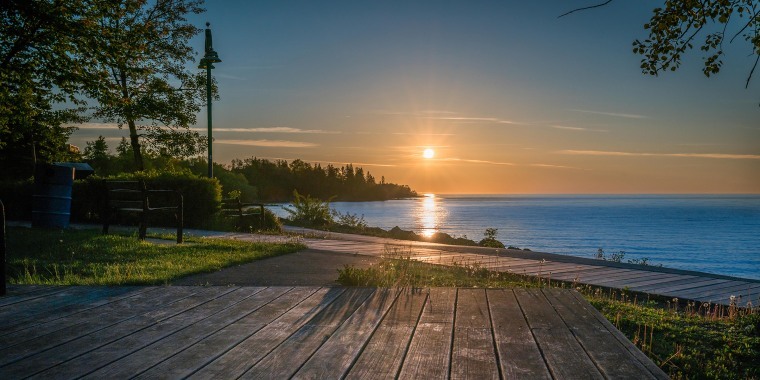 This port city sits on Lake Superior's shore and has 7,000 acres of parkland, 200-plus miles of hiking trails and a sandy beach. From the Lakewalk trail, you can see the Aerial Lift Bridge, a Duluth icon and a rare vertical lift bridge that's often spotted on T-shirts and coffee cups. Otters, turtles, tree frogs and many species of fish reside at the Great Lakes Aquarium. For guests with special needs, there are monthly Sensory Friendly mornings on Saturdays; the volume and lighting levels on interactive exhibits are lowered, and waterfalls are turned off. Next door, the Bayfront Festival Park has one of the city's newest and largest playgrounds. The North Shore Scenic Railroad offers several types of trips along Lake Superior in vintage railcars. The most popular one is onboard the Duluth Zephyr: The 90-minute trip goes through downtown, up to the Lester River and through the wooded Congdon neighborhood. The first-class car has a glass dome roof that offers the best views. Trains leave from the Depot where the Lake Superior Railroad Museum is located; locomotives, cabooses and other railcars are on display, as well as memorabilia like fine china and silver from the heyday of train travel. The Canal Park Lodge is centrally located near downtown and the harbor, with views overlooking Lake Superior and nearby Canal Park. There's a pleasant pebble beach right off the back of the hotel, and parents will appreciate that the staff has thought of small touches like a pizza add-on package (you'll get a pie and breadsticks delivered to your room) and loaner board games and DVDs, which can be borrowed from the reception desk. Kids will be begging to return to Edgewater Hotel, where guests get access to a massive indoor waterpark with four-story slides, a vortex pool, a kiddie pool with zero-depth entry and a lazy river. When it's time to dry out, there's a mini golf course, arcade and free bike rentals. Rooms have a variety of perks like bunk bed alcoves, whirlpool tubs, fireplaces and balconies with views of Lake Superior. The menu at OMC Smokehouse (OMC stands for "Oink, moo, cluck") mixes several different regional barbecue styles. There's Texas- and Alabama-style brisket, Nashville Hot Chicken and St. Louis ribs; Korean Barbecue pork belly noodle bowls and lettuce wraps add a Pan-Asian spin. The lengthy beer list is heavy on local craft varieties, some brewed just minutes away. Sir Benedict’s Tavern on the Lake, known locally as Sir Ben's, is a fun place to go for outside seating and casual food like sandwiches and salads. There are twice-weekly jam nights and visitors are invited to show up with instruments.